Fairy tales tell the truth about us. Hidden in the magic and mischief of those mythic stories are keen insights into the hard lives of little people and the courage and resourcefulness required to survive the dangers of the wild woods and the open road. 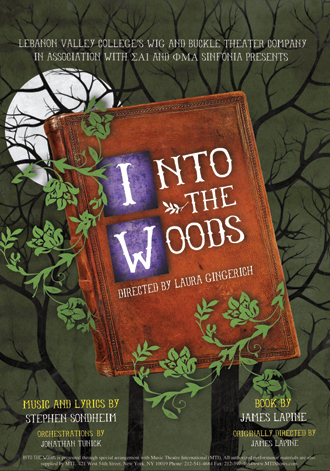 These parables have a universal appeal to the child in us, for they speak to our need for security and happiness in a frightening world—hence the popularity of tonight's show, Into The Woods. In these uncertain times, the Wig & Buckle Theater Company's revival of this splendid musical—we did it for the first time in our 1998-1999 season—seems particularly fitting and proper. Bestselling historian Robert Darnton, in a marvelous chapter entitled "Peasants Tell Tales" in his celebrated but weirdly titled book The Great Cat Massacre and Other Episodes in French Cultural History, points out that traditional tales among peasants in ancient regime Europe served principally as cautionary stories of the dangers of going too far from your home, of stepping out of your predetermined class role, and of relying too much on faith in others when trying to survive in a harsh agrarian economy where the powerful frequently exploited and abused the common folk. The heroes and heroines of these stories, in their original folk forms, are far more bloody and ruthless in their actions than in the versions we usually encounter today as children's "fairy tales"—they employ trickery, deception, violence, and common sense to get what they need to survive and thrive in a brutal environment, and frequently pay the price for their ambitions in failure and self-destruction. In the revolutionary times of the late 18th and early 19th century, linguists like the Brothers Grimm collected these harsh tales of ambition and comeuppance as part of their work in seeking the roots of the nationalist spirit of evolving modern European nation-states, and often managed to retain the directness and brutality of the tales. However, their "authentic" retellings of these stories were already competing with sanitized and "domesticated" versions of these truly grim tales, popularized by Mother Goose books and the like, which appeared after the emergence of an educated bourgeois readership, whose town-dwelling insularity rejected the social realities of peasant life and reduced these warning narratives to children's fables in which everyone who was "deserving" lived "happily ever after." The passage of a few hundred years and further sanitation through the means of classic (and beloved) movies like those of Walt Disney have further distanced most of us from the stark dangers which evoked their originals. 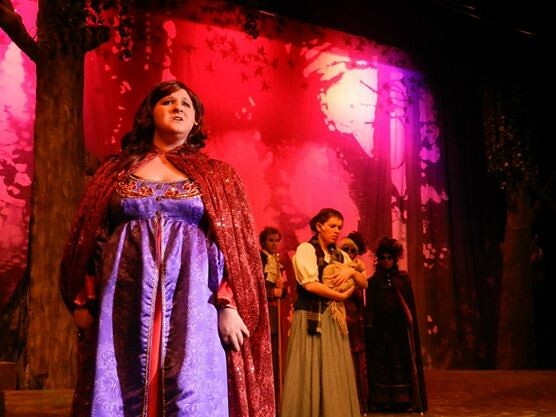 In returning to the delightful and dangerous roots of these too-often homogenized tales, the creators of tonight's show, Into the Woods, tapped into a very deep reservoir of powerful psychological and social forces. Stephen Sondheim and James Lapine's retelling of Grimms' fairy tales opened in New York in November 1987 after development in San Diego. It quickly swept the Drama Desk and Critics Circle awards for 1988 and garnered Tony Awards for Best Score, Best Book of a Musical, and a Best Actress Prize for Joan- na Gleason, the original Baker's Wife. Bernadette Peters, a veteran of Sondheim and Lapine's earlier collaboration Sunday in the Park With George, was a runaway favorite with the critics as the Witch, and was followed in the role by The Cosby Show's Phylicia Rashad. It was, however, not the show's stars but rather the beauty and complexity of Sondheim's music and lyrics that attracted the most attention. For years Sondheim's musicals have explored the darker side of our collective yearnings; often his cynical dissections of modern life's anxieties and sense of personal isolation have disturbed audiences. Into the Woods, however, broke new ground. In its first act the traditional ordeals and dangers of the fairy tale are triumphantly overcome, promising a "happy ever after," but in its second act the characters are forced to confront both the consequences of their actions and the failure of their selfish aims. As one of the most striking of the show's lyrics puts it, "wishes come true—not free." To survive, Sondheim's storybook folk have to reform their connections with each other, to realize that "no one is alone." As long as poverty, economic disruption, abuse of the powerless by the powerful, and the shattering of families by trauma and abandonment exist, and compel us to wish desperately for some- thing better, the need for stories that tell essential truths and offer ways to survive life's dangers will continue. In its hope that after all our pain and loss we can somehow find a real, mature "happy ending," Sondheim's journey Into the Woods, the most accessible and endearing of his works, may help us find our way in a dangerous and deceptive world. Enjoy the journey.